Our Social Media Video Marketing Blast...offering you a lead generation and professional branding advantage! 1. 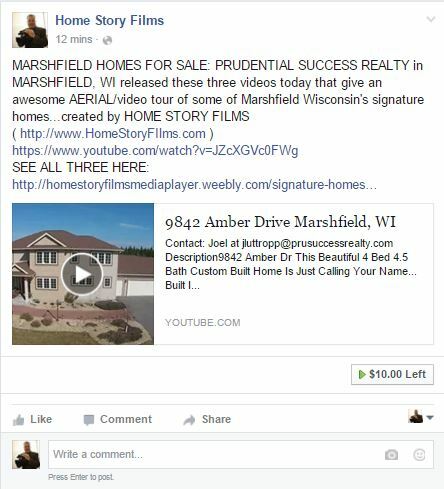 We create a Facebook post announcing your listing. The post will include the video itself, property description and links to contact you as the listing agent. 2. We then create a "boosted post" in Facebook which is a paid ad. We custom create an audience based on location, demographics and interests related to those likely to move or be looking for a house through Facebook's ad parameter protocol. 3. We then "blast" the post to the audience that we create and Facebook users who are likely to move or otherwise be interested in your listing will see your post and be exposed to the listing. This is the marketing genius of social media...from there Facebook users share and interact with the post and are directed to contact you for more information...i.e. relationally/organically generate leads for you!